Top Travel Tips: Passing through Airport Security Efficiently and Hassle-Free! Travel security is undeniably strict and tight in recent times, but we must always remember that airport security workers are doing their jobs to ensure the safety of everyone. We, like any other traveller, expect to travel feeling safe and secure, and if it were that airport security was lax at screening passengers we would not have the comfort in travelling that we do today. When passing through the security section to head to your airplane’s gate, it is normal to feel tense when seeing officers and security stationed everywhere and staring you down, but before going in remind yourself to be calm and patient, and prepare yourself and your luggage well before travelling to follow all the rules they have posted on the TSA website and around the screening area to ensure that you do not have to go through any extra screening. Be sure to read your airport’s travel restrictions for your checked and carry-on luggage. Common mistakes are carrying liquids in containers larger than 100ml (i.e carrying a large bottle with 100ml of liquid in your carry-on, they will ask you to throw it out), and items like razors or scissors. Here is the complete list of luggage and carry-on items that are permitted and prohibited in Canada. 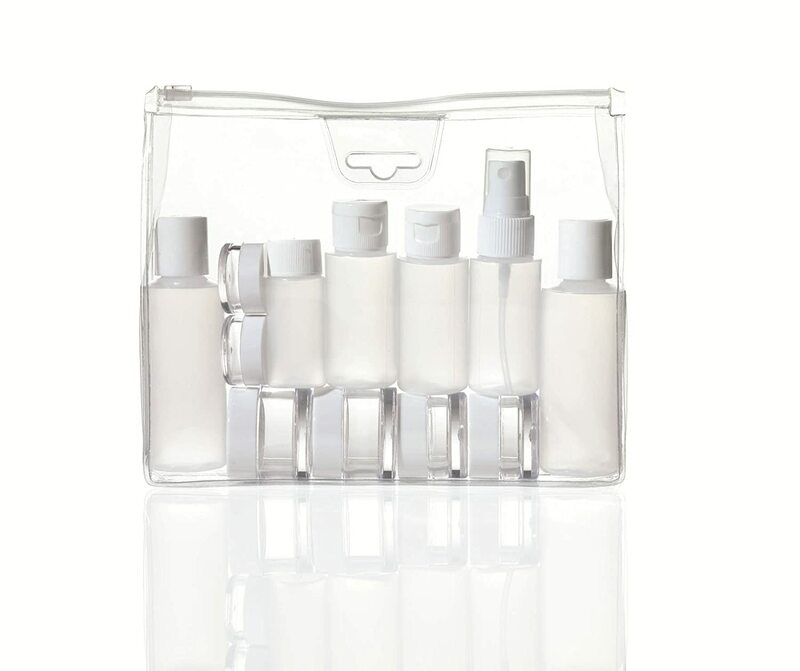 Get handy travel-size bottles for your carry on at Dollarama! It may happen, (as it has to me many times) that you are given extra attention from security officers for reasons that may seem like racial or minority profiling to you, but just be patient and cooperate with them. Remind yourself that they are only doing their jobs, and they are stationed there for long hours doing dull work. You can even turn this into a da’wah moment by cooperating kindly and being pleasant with them to show true Islamic akhlaaq (character). It is a drag being singled out sometimes due to what you look like and what you wear, but try to be patient and just get it over with, because you know that you haven't done anything wrong and you have nothing to hide. Alhamdulilah it has never happened to me, but in the case that you are questioned by officers about the purpose of your trip, make sure you have all of your travel information printed and on hand, such as what hotel you’re staying at or your family’s addresses and contact info. If they ask you several questions, be straight-forward, brief, and don’t think too much about it. This goes without saying but, don't lie! Just tell the truth. If you are wearing an abaya (long Arabic-style dress), you may be subjected to a “pat-down” by a female officer, even if you walk through a metal detector. They will wear gloves and give you the option of doing it in a private area, and will explain themselves about what they will do before touching you. Recently airports in Canada and the United States will single out women who wear the hijab for an extra security process which I personally find degrading, but gotta do what we gotta do so I'll mention it so you're mentally prepared. They will ask you to swipe the material of the hijab on the top of your head with your hands and present your hands to them. They will take a brush and swab your hands and place the swab into a machine, which checks for substances of some kind. After the machine has okayed that you're not covering your head with illegal substances they will allow you to go. Of course, women who wear hijab would be the only type of person who would touch illegal substances and wipe it on their bodies, so only us hijabi women are asked to do such a procedure. The full-body scanner no longer shows images of your body to officers. After I (a woman) had opted for a pat-down by a female officer instead of going into the full body scanner, she took me over and showed me what officers now see during scans, compared to what they used to in the past. Nowadays, all they see is a drawn outline of a body, and any metal substances will appear as points of colour on the image. This article shows you how full-body scanners work now, which mentions that it has been changed in USA, but this article mentions that it is now changed in Canada too. For women who wear Niqaab, you will need to show your face many times at the airport for the purpose of checking your identity. The first time will be while checking in and getting your tickets, secondly at the security section and last at the gate to board your plane. You may request to do this with a female worker, and they will find someone to do this with you aside from the desk. You may need to wait however, and the workers (and perhaps other passengers) might start getting weird with you, but be patient and polite. If a female worker is not available, you may have no other choice but to do so with a male worker. It is my opinion that this should be no problem because the only purpose of showing your face is for workers to confirm your identity. Well before you enter the security check line, ensure you have removed all the metal items from your clothing and put it into your bags, and have finished and tossed any water bottles or large bottles of liquid so they won’t have to tell you to throw it out. Put any metal items (hijab pin, too!) into your luggage or coat which goes on the conveyor belt, and put your shoes on there too, unless they expressly tell you to keep your shoes on. Many times if you beep in the metal detector, they’ll ask you to go back and remove your shoes. Next Top Travel Tips Coming Soon: How to calculate when to pray on the plane during long-haul flights.